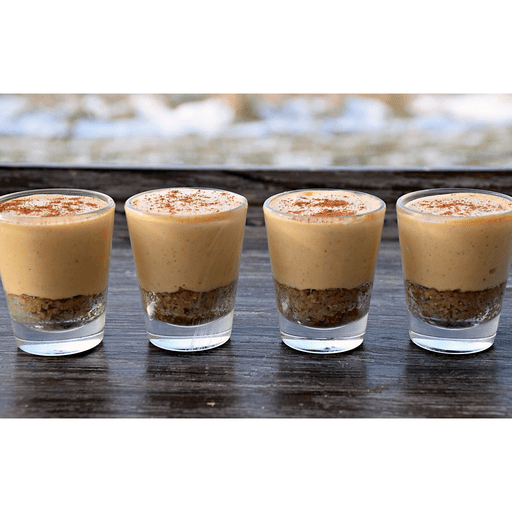 Made with nutrition-packed Greek yogurt and sweet potatoes, these decadent, better-for-you cheesecake shooters are the perfect way to satisfy any sweet tooth. Try whipping up a batch of these guilt-free treats for a fun family dessert or double the recipe for an excellent party food. 1. Press crushed pecan pieces into the container of your choice (shot glass, jar, ramekin, etc.) with the back of a spoon. 1. In the bowl of an electric mixer, beat cream cheese and yogurt until combined and smooth, scraping down the sides when needed. Add in sweet potato and mix until smooth again. With the mixer on low speed, slowly drizzle in the condensed milk, continuing to scrape down the sides until the mixture is very smooth. Add in vanilla extract, salt and cinnamon, beating well. 1. Pour or spoon cheesecake mixture evenly over top of crusts. Refrigerate for 4-6 hours. Garnish with a sprinkle of cinnamon, if desired. Calories 210, Total Fat 10g (Saturated 3g, Trans 0g), Cholesterol 15mg, Sodium 180mg, Total Carbohydrate 23g (Dietary Fiber 1g, Sugars 18g), Protein 6g, Vitamin A 35%, Vitamin C 2%, Calcium 10%, Iron 2% *Nutritional values are an approximation. Actual nutritional values may vary due to preparation techniques, variations related to suppliers, regional and seasonal differences, or rounding.